Dissatisfied members of the All Progressives Congress, APC, in Cross River State have asked the Abuja Division of the Federal High Court to nullify results of congresses the party held in the state. Osun 2018: APC lifts campaign ban, holds parlay for governorship aspirants The suit was filed by a Chieftain of the the party in the state, Mr. Odey Oyama and 22 others. The plaintiffs are challenging validity of ward, local government and state congresses that held between February 24 and May 19. The contested congress had produced Mr. Godwin Etim John as State Chairman of the party to replace the former chairman, Usani Uguru Usani who is now the Minister for Niger Delta Affairs. In an originating summons the plaintiffs filed through their lawyer, Mr. Marx Ogar, they contended that the February 24 state congreses which was ordered by the Deputy National Chairman of the party, Engr Segun Oni, was not valid under sections 85 (1) and (3) of the 2010 Electoral Act and Article 12.7 of the APC Constitution. Cited as defendants in the suit are the APC, and the Independent National Electoral Commission, INEC. In an affidavit that was deposed to by an APC member in the state, Joseph Ushie Ade, he averred that while the ward congress originally billed for May 5, was rescheduled for the next day, the committee chairman, Mr. Stan Ekezie, moved all the materials from the party secretariat to a hotel. The deponent told the court that the results were tabulated at the hotel. “I know as a fact that after our leaders drew the attention of the world to the perfidy perpetrated by the Stan Ekezie Congress Committee in connivance with Godwin Etim John/Pastor Usani Usani, the congress materials recovered from them at Danic Hotel Calabar (their hideout) were taken to the Calabar Area Command of the Cross River State Police Command in Akim where same were deposited with the Nigeria Police Force Area Commander pending the reconstitution of another Congress Committee that would be fair, independent and impartial”, he added. Specifically, the plaintiffs are among other things, seeking, “A Declaration that the ‘State Congress’ conducted in Calabar on 24th February, 2018 with 98 delegates is ultra vires the Electoral Act and the extant APC Constitution. “A Declaration that all the suspended members of the party (including Godwin Etim John) were not qualified to participate in the purported State Congress of 24th February, 2018 and the subsequent Wards, Local Government Areas and State Congresses of May 2018. “A Declaration that the contraption put together in Calabar on 19th May 2018 in the guise of a State Congress did not satisfy the requirements of Section 85 of the extant Electoral Act in Nigeria. “A Declaration that Godwin Etim John; the purported State Chairman of the APC in Cross River State, did not emerge through a lawful process consistent with the Guidelines for Wards, Local Government Areas and State Congresses issued under the hand of the 1st Defendant’s National Organizing Secretary? “A Declaration that the 1st Defendant herein is bound by the report of Major Gen. A. T. Umar; Chairman of the Wards and Local Government Areas Congresses conducted in the 196 political wards and the 18 Local Government Areas of Cross River State between the 12th and 17th days of May, 2018, which report is dated 16th May, 2018 and addressed to the National Chairman of the 1st Defendant. “An Order directing the 1st Defendant herein not to recognize any Ward or Local Government Area Executive of the APC in Cross River State other than those who emerged through the process driven by Major Gen. A. T. Umar and monitored by authorized personnel of the 2nd Defendant herein. As well as “An Order restraining the 2nd Defendant herein and its officers/personnel from recognizing the purported State Congress stage-managed in Calabar on 19th May, 2018 in clear violation of Section 85 of the 2010 Electoral Act and Article 12.7 (x) of the APC Constitution”. In a similar development, four other members of the APC in the state, Hon. Eborty Egbe, Harrison Edor Ribua, Stanley Ekuri Ajom, Joseph Nkang Ogar and Barr Chris Omukwu, in a separate suit, equally asked the high court void the outcome of the May 19 congress where state executives of the party were purportedly elected. The four plaintiffs want the court to make an order annulling/voiding the process which produced the Godwin Etim John and others as chairman and members respectively of the Cross River Executive Committee of the APC. They equally want an order of injunction restraining the party from recognising or inaugurating all those that purportedly emerged through the congress, pending the determination of the suit. 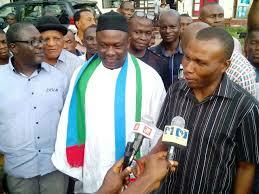 The plaintiffs further prayed the court to order the party to conduct a fresh congress I’m Cross River State. Meantime, no date has been fixed for hearing of both suits.